You don't have to explain your choice, but you can if you want to. I voted for "I am disappointed in Jake and I feel that he should have said or written something about Heath's passing"... although I'd like to clarify that I'm not necessarily disappointed. I'm more perplexed. Sometimes I feel frustrated in this state of "not knowing." But, I'm not disappointed in Jake really. And, in the places where I've discussed this issue in JJJ and HHH and elsewhere, I don't want it to seem that I'm being negative about Jake or even really criticizing him. I still think he's fantastic and an important part of Brokie-hood, etc. But, the rest of the statement that I voted for here holds true for me. I do think he should write or say something about Heath. But, if he doesn't, I'm sure I'll be able to move on (and continue to like Jake as an actor/ personality, etc.). Having a statement from Jake would help me tremendously in terms of coming to a sense of closure about the tragedy with Heath. But, if we never get a statement from him, again, I'm sure I'll come to terms with that (without lingering "disappointment" directed towards Jake). I think the frustration I feel about this from time to time is a passing thing. I posted elsewhere my opinion that the erupting controversy and lashback about Jake in our fandom is unjustified and unfair to Jake. The main reason I feel this way is because I have been through the death of close family members and many friends, and have never issued any kind of condolence or statement about them, because I felt it was private and chose to keep those feelings to myself. I also do not attend funerals, and did not attend my father's or my sister's funeral. I suffered a lot of disrespect from people within my family for my choice, and yet I know that it did not reflect my personal feelings, which I chose to keep private. I find it perfectly understandable that Jake, or anyone, chooses to keep such a deeply private expression to himself. He owes no one any explanation for it, any more than I owed anyone an explanation as to why I chose to mourn in private, and we should not take it out on him. I guess my statement would be a combination of the choices, more like......."I really don't feel that he owes us anything, BUT I am disappointed in Jake and I feel that he should have said or written something about Heath's passing". I am not disappointed. I think it's a little weird though. It might make him feel better too maybe. But that's probably just my thinking. He doesn't owe us anything. I just hope he knows how to deal with his grief and that he can find closure somehow, some day. well, i don't know how i feel. kinda wishy washy i guess. i am a little disappointed, but i don't necessarily agree that he doesn't owe us anything. we are his fan base, and being famous usually means doing things to merely please their fans. think about all the things fandom requires that i'm sure not every actor is paticularly keen on doing, but still do. i just dont' think it would've been that difficult to release something....anything. but i love jake, and i don't think about it much, and i have no disrespect for his grieving. he can do what he wants, and he won't lose me as a fan, but i think i think a lot of people, including myself, desire to know what he's thinking and feeling on the matter. so, sometimes i feel disappointed, but he's his own, and he can do as he sees fit. it's none of my business, but yes, i'd prefer to know what he would say. i mean he's got to know that people are wondering, and almost every famous person has had do a thing or two to appease fans. .......I have been through the death of close family members and many friends, and have never issued any kind of condolence or statement about them, because I felt it was private and chose to keep those feelings to myself. I also do not attend funerals, and did not attend my father's or my sister's funeral. I suffered a lot of disrespect from people within my family for my choice, and yet I know that it did not reflect my personal feelings, which I chose to keep private. My father passed away less than 24 hours before Heath. I was deeply saddened by both events. Because he was my father, I needed to spend most of the next week dealing with all of the events associated with his passing. This included taking my mother to see him at the nursing home after he passed away, going to the funeral home the next day with my mother and my siblings to make final decisions, as well as attending his funeral and accepting condolences from family and friends. I have very little experience with death or funerals, but I knew it was the right thing to do. We received comments, visits, cards, condolences, tears, smiles, and hugs from family members, old friends, new friends, and strangers as well. With so much love and concern pouring forth from so many different directions, I can't believe that keeping totally private is appropriate. No one was obliged to pay their respects to my father, they just did because it was the right thing to do. i'm very sorry for your loss. i send my condolences as well. It's so interesting to see the intensely personal perspectives we're all probably bringing to this question. I think each of our reactions to this particular situation with Jake just has so much to do with all of our own feelings about grief and loss (and also our own personal ideas about how best to respond to grief and loss - both in terms of personal reaction and public etiquette). This is really such an incredibly intense thing to be going through and working through as a community. Thanks, Forsythia, for your condolences and support. This sums up the situation succintly, I think the bold part is especially true here. Each side has their own reasons and logic, not any one side is more true than the other. My condolences for your loss;I've already passed for this situation,so if you need some support or stuff,count on me. I agree with all you say about other people's,specially friends and relatives,behaviour in this case; nobody have obliged to say or do anything,they don't owe you anything,nobody has told them what to do in situations like this...But there's something one must have for oneself,without others persons pressure: RESPECT. Well I voted for; "I think it,s wierd". I think we could go on and on debating this issue forever, but until Jake actually says something, I don,t think we,ll ever know why he hasn,t said anything. I am surprised he hasn,t yes. I think his fans were certainly expecting him too, given that Michelle and Heaths parents said something, not to mention mumerous other famous people. No he doesn,t owe anyone anything and if he really doesn,t want to say anything then he doesn,t have too. I just find it a bit strange though. It could of course simply be that he,s a private person and he prefers to keep his private thoughts about this to himself, who knows. Whatever he,s doing and wherever he is, I hope he,s well and happy. He certainly looks happy in the pictures with Reese. Getting back to Jake's lack of a public statement, well, how difficult is it to release a statement through one's agent or press secretary? Isn't that part of the reason actors have agents and press secretaries? You know, I wasn't expecting Jake to call a press conference or sit down for a televised interview or release a 16-paragraph eulogy. A simple statement released to the public on the order of "I am deeply saddened by the loss of Heath, and my heart aches for his family and friends. He will be missed" would have been sufficient for me and probably for lots of other people, too. Yes, Jake is entitled to his privacy, and I'm certainly not expecting him to bear his soul to the public at large. But he should have issued some sort of statement if for no other reason than because his fans were expecting one. They wanted to hear from him. For a good while there, Jake had many of his fans worried about how he was faring after Heath's death. He owed those fans something for their concern. I interpret his inaction as inconsideration and disrespect -- not toward Heath or his family but towards Jake's own fans. When you're a celebrity, dealing with your fans is part of the package. It's one of the prices you pay for your fame. If you want to live in total obscurity, you don't become an actor. I can understand why people are disappointed in him. I voted for "I am disappointed in Jake...." even though that statement is probably worded too strongly when it comes down to my actual feelings on the matter. I consider myself more of a BBM fan than a Heathen or a Gyllenhaalic, so it's really not my personal disappointment I'm addressing here but that of Jake's fans (and Heath's fans, too) who desperately wanted to hear something from him. Look at it this way: had Jake issued some little statement, this whole matter would have been over. It wouldn't still be a topic of discussion here at BetterMost... or anywhere else for that matter. Someone -- his agent, a family member, a close friend -- should have pulled him aside and advised him to issue a short statement, even if he didn't want to, because it was the sensible thing to do. In fact, I'm kind of surprised that he didn't see the logic in issuing some sort of statement from the very beginning: Jake issues a statement, the press and fans have what they want, and everyone moves on to other news. As things stand now, you can bet that anyone interviewing him with regard to an upcoming film is going to ask him about Heath and his reaction to news of his death. He's going to have to say something at some point, so it seems to me that all he did was prolong the process, create more intrigue, and upset some members of his fanbase. His not issuing a statement really makes no sense to me. The problem is that,as you say atz75,we're going to go round and round in circles,repeating the same words and concepts over and over again...I've spoken more than a time about respect,and for me it's the most important of all this.Respect for Heath's memory,respect for his family,respect for his closest friends...And a rather meaningful point that Fran has said and which I haven't tought about before-even if I consider myself a Gyllenhalic,or maybe because of this...-:respect for all the fans who could feel worried about his emotional situation. Fans whom he doesn't owe anything,it's true,beyond his public image;but whom he owe,that's for sure,enough fame as we're speaking about this situation now...All who admired his work and,even,his look have contributed to his fame and his reputation in movie's world,whatever he thinks or not...It's not necessary for him or for anybody else to make a press conference to say how he feels,I have repeated this until being bored;his words could be taken in a wrong sense for some dirty-minded persons and,maybe,his agent has recommended him to be silent.That's right for me. But you're only speaking about this possibility of SPEAK; but for me the most important is TO DO.And we haven't read or heard anything that shows he has shared some public or private act in Heath's memory.That's the weirdest thing for me.Do you know what has happenned here with all this stuff?That all of us,Brokies,Heathens and Gyllenhalics,moved by a love to the movie and,as a consequence,to all the persons who contributed to its filming,have confused the story with the reality.As if Heath and Jake must be a kind of little Ennis and Jack in real life,if not lovers,the best friends of the world.And maybe they were only coworkers in a successful movie and nothing else than a certain friendship that lasted what the promotional work lasted.That's what I'm coming to believe,according to what I'm seeing. Well I am puzzled,by his reaction.Not annoyed,not even upset,just puzzled.If nothing else after any death of someone you are associated with,etiquette usually prevails. I remain unconvinced he has done something in private,merely because in this day of invasive press and nothing is sacrosanct,I am sure it would have emerged by now. With respect to the man,I have never lost anyone close,as yet.So I have no idea how I would react.Could it be his grief/shock was too great, initially,and then as it lessened.it was just too late.Who knows.Or did he just misjudge public reaction,then leave it too late. I will not judge,because years ago when Princess Diana died,I was perplexed to say the least,at the public reaction.I just did not get it, and was somewhat scathing.Then hey presto,I am suddenly pole axed by the death of Heath.So we just never know. Lets be honest,the Queen completely misjudged her initial reaction to the death of Diana,and was lambasted in the press over it.She is surrounded by advisers,and yet got it wrong.By the time she issued a statement,it really was too late.It looked like the after thought it was.If after decades of duty and royal deaths,surrounded by advisers,with a wealth of experience,she can still get it so wrong,then I guess Jake certainly can. I hope it does not come back to bite him.Particularly,if he took advise on how to react or not as the case might be.Heath is gone and we cannot change that.It would be too bad if Jake then suffers a career slump as well.Maybe like the Queen he was just given bad advice.We all get it wrong sometimes,particularly if it s our first time dealing with a particular situation personally.Sometimes we even get it wrong with the very best of intentions. I just hope,that one day Matilda will get comfort from the knowledge of how deeply her father touched so many.In much the same way I am sure Diana's children gained comfort,from those whose lives their mother touched. When asked after the BAFTA ceremony if Ang Lee was the Godfather of Matilda, because Ang called himslef "matchmaker", Heath and Michelle said that it's Jake actually. Later during a press conference Jake confirmed he was the Godfather. Ever since press mentioned the fact every now and then. It seemed that Jake and Heath were very close during BBM promotion, but we really can not know for sure how close they remained (you don't have to be close to your kid's Godparents btw). The one lived in L.A. the other in N.Y. I believe they saw each other every now and then, but that's about it. Each had their own life. I'm sure Jake, when he heard about Heath's death was very sad, but i doubt he was as devastated as some claimed. He even went to a Rufus Wainwright concert days after Heath's death, or shopping in Soho with Reese over a month ago etc. Life has to go on and his main priority at the moment seems to be his girlfriend. I also didn't expect him to react like Jack Twist would have reacted if Ennis Del Mar had died before him. I can distinguish reality from fiction and while i understand that life goes on and he has other priorities in his real life, a statement/tribute would have been a sign of respect towards Heath, I personally appreciated all the tributes from Heath's family members, friends and colleagues. Jake for whatever reason, may it be personal or professional, decided not to do it and i don't think we will get anything from him. If we want it or not, we must accept it and move on. And maybe they were only coworkers in a successful movie and nothing else than a certain friendship that lasted what the promotional work lasted.That's what I'm coming to believe,according to what I'm seeing. That's what I came to believe too, even before Heath died. To anyone who can honestly state "I understand why he hasn't said or written anything about Heath's passing", please explain it to me and the rest of the world. You must be in intimate touch with the depths of Jake Gyllenhaal's mind. Perhaps I'm nit-picking with semantics, but the results of the poll thus far seems to me like "lying with statistics". Yes, I'll admit I'm "disappointed", but there's no way I could ever say that I "understand". Well for me, and I was one who voted for that choice, the only thing I can relate it to is last year when my grandma died. From the time when she was diagnosed with advanced cancer (coincidentally today I've just realised), and we were told she had only months at best, and then when she came out of hospital after an emergency operation, she moved in with us, and she was with us until the day she died in July last year. I watched her suffer every day, and helped as best as I could with her care. For four months she was with me constantly, whether physically, or when I was at work, emotionally. When she died, there was just emptiness, a big space where she used to be, and a big hole in my life. Though I had to go to the funeral, I wore dark glasses and I wouldn't speak to the rest of the extended family about her. I didn't want to have to talk about her, explain my feelings about her death or anything. I didn't want anyone's condolences, and well-meaning though they were I didn't want anyone's sympathy. I didn't want to have to explain myself and feelings to anyone. I dealt with it in my own way, and at that time I didn't want any fuss - I didn't even tell the people I work with she'd died until a couple of months later. As far as they knew I was just on a leave of absence at the time. Different circumstances entirely, I know, but bereavement and grief affect everyone differently (and I certainly reacted completely differently last year to how I have in the past when friends and relatives have died). I can't claim to know anything about Jake's thoughts or state of mind, but I know how I felt last year. Maybe he has said things in private, and maybe he's said things to Michelle and to Heath's family, and ultimately it's his choice whether to say anything in public, that's his right. firstly, let me say i am very sorry for your loss. my condolences go out to you, as well as another member on this thread who suffered a loss recently. i liked what you had to say. made sense. i also agree with nova20194, about not understanding. i guess really, everyone has a different take on the subject. i do wish jake would say something....but i certainly have respect for those who see it differently.. Your feelings about your grandmother and your reaction is very similar to my own when I have lost friends and family members - I have lost several, and the first major loss in my life was my sister at the age of 35. Nobody really understands the choice to keep quiet, to mourn privately, and it seems to produce a lot of anger in those who have a need to grieve openly - they also seem to not be able to accept those who grieve privately. Some of my strong feelings about this issue come from being the kind who must grieve privately, and I have absolutely no doubt that Jake is grieving. But those who have either incurred no big personal losses themselves, or who are the kind who grieve more openly, will never really understand, and they do tend to lash out. I suffered a lot by my family not wanting me to grieve my own way, and I really don't want Jake to suffer that same thing on top of his grief. good point. yes, i understand how you feel. although i already posted how i feel, i will say that i can see how the press would twist (no punn intended) what jake says, no matter what. for example, if he had released a statement saying "i am deeply saddened by the loss of my dear friend and fello actor heath ledger", and then later was spotted shopping with reese, the tabloids would have a hey-day with that. they did it to mary-kate olsen, (who i really don't care about) , but it was reported that she made a very similar statement as i mentioned, and was blasted by a few different magazines for being at a bar 3 nights later.......so, with that being said, he may well be a lot safer to say nothing, and then no one can lash out at his choice in endeavors, because there would be nothing to contradict them. My bad, maybe you want to take a shot at better categories? This is the best I could do. Not necessary. I probably just over-reacted to my interpretation of some of the words, especially since I'm among those who are disappointed in Jake's silence. I'm sure that no one is trying to imply that they understand what's going on in Jake's mind. I suspect it's more that they support his decision to remain silent. I suffered a lot by my family not wanting me to grieve my own way, and I really don't want Jake to suffer that same thing on top of his grief. I guess that's the heart of it. Both as fans, and as fellow human beings, we feel concern for Jake. I think another important thing to remember, regardless of how everyone grieves as individuals, is that grief's not a fixed in stone limited time thing, but a continual process - shock/numbness, sadness, anger, apathy/depression, and finally acceptance, and everyone has to work their way through that process. They don't always come in the same order, they may be fleeting, and sometimes psychologically you miss a step, and it can come back months or years later. When his sister died, my dad reacted very strangely, but then seemed to recover and accept it, but he hadn't got angry. Three years after she died it came back and hit him, and he nearly drove my mum to divorce with his reactions to things, but he ended up having counselling, and he worked through it. Again, everyone's different in how they work through the process. Who knows? Maybe Jake just wasn't ready to say anything publicly, and maybe he will in time. and reading that brings tears to my eyes, in a sad way, but also in a good way. I am one of those that voted for: I really don't feel that he owes us anything and I understand why he hasn't said or written anything about Heath's passing. I have mostly tried to stay out of the discussion, but since nova asked for some clarification... For me, when it comes to death and grieving, I feel that often, there is no understanding. No understanding the how or the why, the emotions, the circumstances, therefore, while I don't know how or why or what is going through Jake's mind, I say that I understand it, because to me, all things come with grief: the good, bad, the ugly, and outbursts as well as silence. Someone going through the most normal behaviors on the outside could be experiencing the most intense grief on the inside. So regardless of whether it's screaming or withdrawing, or 'acting like everything is normal,' I say that I understand. Hope that makes some sense and helps to clarify. In a way, it is the lack of understanding that makes it understandable. from when my family died all within 18 mos of each other. I didnt ever want to talk about it. at this time anything he may say, would never suffice. ifyoucantfixit, I certainly and definitely respect your opinion as I have said all along I can see both sides' arguments. But I seem to remember back when Heath was alive there was a discussion about how Heath hated being chased and goaded by the paparazzi. You have said to the effect that he's in this business, he should tolerate this kind of treatment, and if he couldn't, then he should consider leaving. So it was Heath's fault. But now, you are equating those who wanted to hear just a simple statement through Jake's PR as paparazzi, which I can't disagree more, and now the fault is on them. Double standard much? This kind of back and forth argument is getting really tedious and going nowhere. May I suggest the mods to consider closing this thread? I don't see a reason for closing this thread at this time, until now people have just stated their opinion without becoming personal. The discussion will die down eventually and we will move on. I agree. This is obviously an issue that some people feel very strongly about. But we all have a right to our own opinion; that's what a poll is all about. So let's disagree respectfully. If you feel like you'll be upset by someone's opposing viewpoint, then please simply try to avoid this thread. I think its a bit weird that he hasn't said anthing, but on the other hand, I dont really know what I would be expecting him to say. But don't we all still enjoy reading/hearing all the great quotes/tributes from family, friends and co-stars about him? Through them i learned a lot more about Heath and respect him even more. He was so private, kept all his talents to himself, those people are now sharing it with the world. They want us to know what a multi talent he was. They are a great counterpart to the tabloid stories about him. I really appreciate that! What if everyone who knew him remained silent? We wouldn't have any of that! I think having this thread open is important, because it provides a place to work through this issue on its own. Otherwise, this question would continue to permeate all sorts of other threads (like HHH and JJJ where this discussion has been very intense and interesting... but which has also steered those threads in unexpected directions at times). So, it seems reasonable to have a space dedicated to this topic. Thanks for agreeing with me Snavel and belbbmfan! Jake has his own life to lead in his own way. We were given a great and wonderful gift in his performance as Jack Twist. I wish Jake Gyllenhaal all of the very best in what I hope is a very long life, and I hope to see many more film roles of him long into the future. your own choosing... If this issue is not something that can be kept private.. Nothing is. No disrespect meant to anyone here, but I guess this is what's been niggling away at the back of my mind about this whole discussion - to me anyhow it feels kind of "disrespectful" somehow to be questioning Jake's motives for not speaking out. The media and the paparazzi's "defence" for their chasing of famous people would be that they do so because there's a public interest, and there undoubtedly is because otherwise discussions such as this wouldn't be going on. If we switched on the TV tomorrow though, or opened the newspaper and saw that Jake had made a statement I suppose the response from fans would be split between "Thank god he's finally said something like he should have before" and "That's good, he seems okay". Maybe the fact that we're having this discussion though says more about our response to Heath's death though rather than Jake's. I don't know about anyone else, but I've never been in this situation before. We saw a film that had a great actor in it, and maybe we saw his other work as well, and that film and his performance in it affected us deeply. We were in awe of his great talent, and the more we saw him on TV and read about him as a person as well as a great actor, we took him into our hearts, and that and the impact he's had on our lives through BBM made us feel a huge sense of loss at the news of his death. This is a strange situation though, because he's not someone we knew personally or ever met, but because of the impact he's had on our lives, we still feel a sense of grief. It's something though that we can't talk about to non-Brokie's because they'd think were crazy, so discussions like this are our way of trying to make sense of it all and come to some sort of acceptance. Maybe then, wanting Jake to say something reflects more about our need for closure. Does that make any sense? Makes perfect sense to me.I just want to feel I think ,that Heath was as important to him as he was to us.In fact more so.But the problem is,that fiction is merging with reality in my head.I comprehend it is unreasonable,but cannot seem to shake it.I would just like to read something,heartfelt from Jake,almost so that I can justify what is happening in my own head. I don't feel it's odd or inappropriate to question what's going on here. And, it's certainly not out of lack of respect or affection for Jake. If I didn't care about him I wouldn't care whether about how he reacted to Heath's passing. Essentially, Jake is a public figure with publicists and an active interest in engaging with the public and probably particularly his fans. This is a case where his fans are interested in what's going on and are showing concern for him. I don't think there's anything at all wrong with that. I'll just reiterate what I've said multiple times now (in multiple threads)... Jake was Heath's most significant co-star in Heath's most significant movie. We've heard from almost all of the key individuals associated with Brokeback at this stage, with the most recent being Anne Hathaway. Jake's silence just seems glaring with these factors taken into consideration. Added to this Jake is the godfather to Heath's child, essentially making him a symbolic family member. On an etiquette level, at the very least, a brief eulogy-type statement does not at all seem unreasonable. But, it is true on a personal level, I'm really hoping to hear from Jake in terms of coming to closure on this for myself. That's just how it is for me. I'll feel particularly unsettled about this until he's heard from or until I have a better sense of what's going on. And also, as a Brokie, it just seems logical that this would be a concern and a particular interest. I don't feel concerned over Jake's silence at all. We all deal with our grief in different ways. Jack Gyllenhaal is a man with a solid moral center, he will reveal his grief and true feelings in his own time. I know that it is a blessing for Jake that he has been made aware of the support and affection of millions for him and his career. I kept expecting that he'd say something and more time went by and I thought, "Hhmm, it's kind of odd that he hasn't said anything yet." I'm not disappointed that he hasn't said anything. I was just expecting for him to say something like a couple of weeks after Heath's death and when he didn't it struck me as kind of odd, for a fleeting moment. People do deal with death and grieve in their own way and I don't think he owes us anything. Now I just don't really think anything about it except that I hope Jake has made his peace with Heath's death. I have an uneasy feeling that the blizzard of accusations directed towards Jake about his sexual orientation have played a cautionary role... at least with his publicists. But sooner or later questions about Heath and BBM are going to be brought up in an interview. BBM garnered awards and acclamation that cannot be ignored. And, in fact, established Jake as a SUPERSTAR. God knows why I have to open my mouth and I'm never here except when I lurk and enjoy myself reading. I still can't breath when I think about Heath's leaving us. I have a huge lump in my throat now while I'm trying to write this. I'm not a doctor but I am a licensed health care professional and I show you Jake's grief... his pretty serious ankle injury and his accompanying Game Ready. Family and close friends of a deceased person often show sighs of grief via accidents and injuries. I'm not surprised that Jake has a serious injury and this may not be all that he s suffering. When my mother died I followed her wishes to her neighbors great chagrin. She made me promise when she was lucid not to allow anyone in her apt if it wasn't up to her strict standards...I didn't. When I called her friends and they told me they would be right over I said NO. Some of them still don't speak to me and I could care less. I had a memorial for her and tried to do things as she wished. I respect Jake's right to grieve as he wishes though I do worry that he needs to let it out...perhaps he will one day. I also know that Heath and Jake were the closest of friends...Jake is Matilda's Godfather and it has been reported elsewhere in Jakeverse that he is fulfilling his promises. Jake is a verbal open emotional person who is also deeply private and may even be paying homage to Heath by his very silence. Rnmina, thanks for that interesting post. I never thought about the ankle injury being related to his feelings over Heath's death but it does not sound at all far fetched to me. I didn't understand what "Game Ready" meant though. I can understand carrying out your mother's wishes. What I don't understand is people not speaking to you anymore because of it. I agree about Jake being private about it. Even the most outspoken people can become very private when it comes to dealing with death. In a statement his PR stated that the injury wasn't serious. I, not a nurse or doctor, noticed that he doesn't always use the crutches and often he seems not to know how to use them. I've never been on crutches, but don't the docs or nurses have to teach you how to use them in the right way? As for the friends of your mother who don't talk to you anymore. That's just low, they must understand it was your mom's wish and respect that. As for Jake and Heath, i doubt anyone here knows (also the ones that claim to be in the know) how close they still were and what is going on. They should do, but don't always. Some years ago now I'd been using a walking stick for a couple of years before a physio thought to mention to me that I was doing it wrong - it'd never even occurred to me that there was a right or wrong way. Same thing back when I was at college and fell one night at a college disco and tore all the ligaments in my knee and got issued a pair of crutches by the hospital. Mind you, the emergency department was pretty hectic that night so I think they just wanted to get me out of there so they could get the next patient in! Chiming in late to say I voted with - and this is unusual for me - the vast majority. I've believed all this time that Jake owes us, his fans, absolutely nothing when it comes to baring his personal, private pain, and he owes the media less than that. I've always maintained that artists, in general, don't owe us anything except perhaps the best performance or piece that they can give at any given time. And I don't even know that they owe us that. But then that Protestant Work Ethic I was raised and regimented in rears its ugly head and tells me maybe they should feel they do. OK, so perhaps they owe us the best work they can do. Beyond that, they don't owe us Jack. So to speak. I agree that Jake doesn't owe us anything. But, this question isn't all about us either. And, it's not about his private pain or personal grief. I've said from the beginning that if it was an intrusive effort by paparazzi to try to capture Jake's private emotions... that would be entirely inappropriate and something I would never want to see happen. I do think it's entirely appropriate to expect a eulogy for Heath. It's about eulogizing a friend and one of his most significant colleagues in his career. I still find his silence very perplexing, especially in light of gestures other colleagues have felt moved to make. How would we feel if none of Heath's colleagues made the tributes and eulogies that they did? Clearly, Ang Lee, Anne Hathaway, Michelle Williams, Daniel Day Lewis, etc. also didn't owe us anything either in terms of a statement. So in an extreme hypothetical scenario there could have been no eulogies by Heath's filmmaking/celebrity colleagues, etc. But, of course, there are now so many tributes by professional colleagues, friends and family that there is a big thread here all about that. I think having those tributes out there is important to honoring Heath and those tributes seem important to many folks here on this forum. To me Jake continues to feel like a glaring omission amongst the list of tribute-makers. When my mother died recently, the hospice nurse was very helpful afterward. My brother and I would ask her, "Should we do such and such?" and she would reply, "Whatever is best for you. Some people do X, some people do Y. Whatever you feel most comfortable with is what you should do." Everybody grieves in their own way, she said. There is no right or wrong. Yes. But many of his other colleagues have also chosen not to say anything. I haven't heard anything from Christian Bale (maybe I just missed it). Or Terry Gilliam. Or Billy Bob Thornton. Or Todd Haynes. Or Matt Damon. Or his other siblings (beside his beloved sister Kate - didn't he have another brother and sister?) There are many people who've known him intimately and/or worked with him closely who have chosen not to eulogize him for whatever reasons. Why can't we respect that choice from Jake? Perhaps he feels he can't properly put into words what Heath meant to him and so trying to would do him a disservice. Or perhaps it's just too difficult in general. As has been said here many times, most recently by Katherine, everyone deals with grief in his own way. While I certainly would be comforted by a eulogy from Jake, as I've said, I can respect his choice not to make one. You should check out the tributes thread, there are a lot of tributes/quotes from Todd Hayness, he even dedicated Heath the ensemble award for IMT the whole cast and crew got. Christian Bale also payed tribute and recently did an interview, you can find it on youtube, where he talked about Heath. About Terry Gilliam i'm not sure, but i think he also said something. About his sisters, all three sisters, Kate and the two half sisters, as well as the parents payed tributes. Wrote very moving eulogies! OK, so I missed a few. I'm sorry, but this shows that you haven't read the replies on this thread. Nobody is angry with Jake, at the most some people are dissappointed with him or baffled by his silence. We all still respect him as the person who gave us Jack just as we respect Heath for giving us Ennis. This is not LJ where vicious rants were posted against Jake, this is just a discussion thread where people can post their feelings without being badgered or misinterpreted. Exactly right Mel. I voted for "I think it,s weird" but again that,s just my opinion. I certainly don,t think any less of him for not saying anything and it doesn,t mean I won,t watch any more of his movies. I still think it,s a bit odd that he hasn,t said anything, BUT, that is entirely his choice and he obviously has his reasons which are personal to him. He doesn,t owe us an explanation and if chooses to be silent then so be it. By the way I havn,t seen any vicious rants against Jake on LJ? Where are they? I understand totally that after Heaths death people were angry, upset and a million and one other things, but that does not give them the right to attack poor Jake. By the way, what doesn snark mean? I,ve never heard of that before. I was replying to a post where the poster said that s/he experienced that doctors and nurses not always take their time to treat their patients properly. And my reply was that you'd think rich actors/people can afford better doctors or treatment. I don't get what was offensive about it. I also didn't notice vicious rants against Jake on LJ. I've seen plenty of fights whether Jake and Reese are a real couple or not though. I think his BBM fans are the only ones who wonder because of the lack of statement/tribute, other fans of his don't seem to think about it too much. I don't post on here but I have been reading it. could Jake making any kind of statement be our business. How could anything he says or doesn't say change our life? me.... cause... why does it matter. It's a private matter and should have no effect on any of us. I also didn't notice vicious rants against Jake on LJ. Don't feel any differently about Jake; but I sure as hell have lost a lot of respect for some of his "fans." It personally affected me to see those who styled themselves as "Jake fans" turn on him, like he was revealed to be a god made of clay after all and deserved to be attacked. And yes, I have seen some of the commentary about Jake as an unjustified attack on him personally. I think it must have been only a few people. What i notice when someone posts his pics there... most of the posters are drooling! Every actor/actress gets nasty posts from haters. It's like that unfortunately! Though i understand it's annyoing like some posters on imdb.com who come to Heath's board and call him "a piece of crap junkie". Like i said, it's annoying, but we can't do anything about people like that! Like i said, it's annoying, but we can't do anything about people like that! And I'm sure the celebrities are completely used to it, if they pay any attention at all. Like a rich successful movie star is going to let himself get upset over what some pimply troll on imdb said about him! I'm sure they save it for comments by professional critics and industry bigwigs -- people with actual power and/or credibility. I don't know about the slicing him up part, but the rest applies. He's an actor, he was a friend of heath's, he was godfather to their child..he is articulate and he should have said a simple statement on the passing of his friend and co-star. has he ever publically mentioned heaths passing yet? Not to my knowledge...sadly life is short for all the rest of us living in a frenzy trying to get everything done..and this decade of 2000 is a strange one with Sept. 11, father dying....etc....but we dive in to the next exciting moment to drive away morbid memories...actors too go on with their new movies, girlfriends...nothing permanent, just another giddy rush. Obvioulsy he has never done an interview, where he has been asked about Heath's passing, and that indicates to me that he has made it an "off limits" question. But then again, has he done ANY interviews in the past 12 months. I guess if he has, it was to promote a new film, and as has been seen most times before, in those circumstances, they ONLY want to talk about the film they are promoting. I have also thought too, that maybe he was caught in the crossfire when Heath and Michelle broke up, one or the other using him as a sounding board, and as happens, in such cases, there could have been some words spoken that he may regret now, and would not want to seem hypocritical, if those words were not in Heaths favour. Who knows......I would hope that it was not that they had fallen out. Jake seems a very deep and meaningful person, maybe he just cannot find the right words. To be honest, I'm very puzzled by thoughts that Jake owes anyone some sort of statement about Heath's passing. Yes others have come forward to give a statement. That was their choice to do so. Death and how one handles it is a personal matter. I can't imagine being so intrusive as to expect someone to say something at a time like that if they choose not to. If anyone ever approached me at the time a family member died, and wanted me to issue a public statement, the response they'd get from me is "That's not any of your business." Well said Chucky......I agree, how we mourn is very personal, and we have the right to do so in our own way. asked Matt Damon, his thoughts. Nor have they asked his costars in Ned Kelly like Orlando Bloom. I dont think anyone here is "demanding" or "dictating" anything......of course we are curious because of our connection to BBM, and this poll only asks our opinion. We all love Jake and whether he comments or not, makes no difference to how one feels about him, and most agree that it is his personal choice as to how he mourns the loss of his friend. I was one of the people who originally was dissapointed that Jake didnt say or write anything about Heath's passing, but I feel different now that some time has passed. I have more of an understanding that Jake held Heath very close to his heart. I dont feel he owes us or me or anyone an explanation. Jake is going through much to much of an emotional grieving process. I believe he went through and continues to go through a lot of hurt at the lose of such a close friend. No explanations needed. I just didnt see Jake as such and emotional person like any one of us who has lost a loved one. I saw him as a Hollywood star. We dont broadcast our feelings to teh world. Why should Jake? If I could change my answer to he owes us nothing that is what i would do. Wow ! you have just summed up exactly how I have been feeling of late. Time has changed my opinion too. Why do we forget that these people we adore, are actually humans as well as film stars. I do anyway, and it serves me well to be given a reminder some times. For months I expected/waited for Jake to say something, now I know it was more to do with myself, if Jake had said something it would have been of comfort to me. I no longer expect anything, respect his silence, we all cope with grief in different ways. Exactly it would be to comfort me and soothe my pain and hurt. Heath is so very missed. Now that some time has passed, I have dealt with some of my mourning. Of course with the awards Heath is sure to continue to get for his portrayal as the joker I feel more sadness for the loss of such a talented actor and star among stars. Heath will always be one of "our boys" from up on Brokeback. Heath and Jake will always be Ennis and Jack to us. human relationships are so complex. Maybe the were very close. Maybe they discovered that after BBM, they really didn´t have so much in common. It´s impossible for anyone to say. Either way, I´m sure Jake grieved Heath and whatever his reasons were not to go public, I feel confident that those reasons felt valid to him. Me too would have loved to (still do) hear Jake speak about Heath, but like someone said, that has more to do with my feelings and my own comfort (and yes - curiosity), than anything else. we have to settle for the fact that we simply don´t know anything about their relationship or about Jake´s feelings or reasons for staying quiet. Now that time has passed, I've come to terms with the Jake issue more. I'm one (as you all know) who thought that Jake owed it to Heath to make some kind of eulogy. I don't think Jake owes us... I think he owes Heath. A eulogy is about honoring the person who passed away... it's not about appeasing a fan base. Although, it's interesting that this issue is still bothering us and nagging at us (with the revival of this thread) after all this time. From a professional perspective... Heath was Jake's most important co-star in Jake's most significant cinematic achievement to date. BBM will be the movie that gives (or has given) both Jake and Heath a true place in cinematic history (not to mention it was BBM that gave Jake so many of his prestigious awards). Sure Heath had many other co-stars... many of them have made eulogies and some haven't. But, I don't think there's any question... even among non-Brokies... that Jake has a special status as "the" co-star. 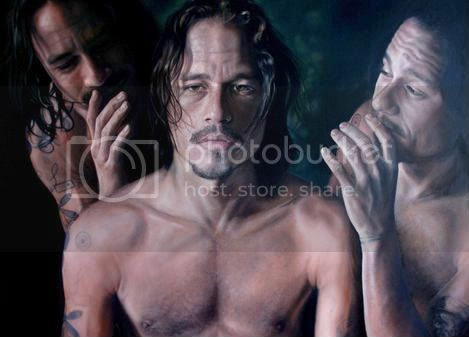 When people think about the BBM poster... which is one of the main images many people in the public have of Heath... and will be one of the images to follow Heath into history... it's a joined image of both Jake and Heath. So, from a professional standpoint I think it would have been more than appropriate for Jake to make a eulogy. But, after seeing how brutal the questions about Heath seemed to be for Maggie to get through during a Golden Globes red carpet interview that I happened to see... I begin to understand better how almost impossible it would probably be for Jake to deal with similar questions. I still think he's very deliberately avoiding interview situations, and I think it probably has more to do with strong personal, emotons than anything else (but of course, my sense of this is purely my interpretation, and could be way off base). And, I want to add that I completely agree with this. 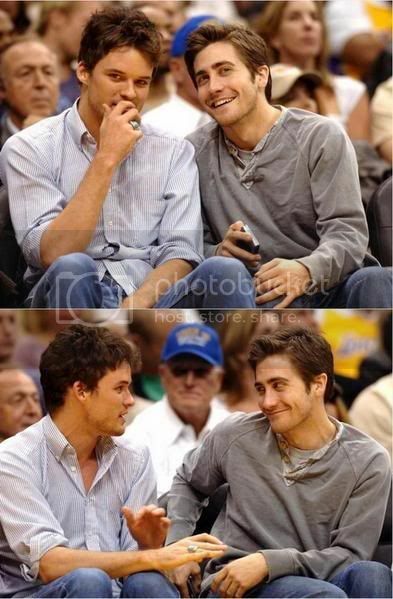 I like Jake and Heath equally... I'm neither a Heathan nor a Gyllenhaalic... but I have an everlasting affection for both of them because of their status in relation to BBM. Nothing I've said about Jake is meant to be a criticism... it's about my confusion over the situation. And, I'm still worrying about this (like many of us clearly) after all this time because of the above-mentioned lasting affection. It could be that even if they were close, the fact that Jake is Matilda's godfather makes me think so, their job, lifestyle "kept them apart". Actors are people costantly on the move, different continents, time zones and so on. No wonder their divorce rate is high, IMHO. Well, we and a lot of film organizations and his fellow actors think BBM is the most significant cinematic achievement Heath had applied himself to to date. There's no reason to think Heath or Jake thought so. Yes, they got awards or were nominated, but for them they could have just thought "Hey, my first stepping stone up." Or as Heath himself said at one ceremony/Red Carpet the most important thing BBM had done for him was to give him "a family". Heath wasn't about accolades or making history, he was just about the quality of work and the variety of roles. He may have thought that his role in "Monsters Ball" or maybe "Batman" was his best performance. I don't recall if he ever said. Jake is concerned with quality too, to some degree, but I won't cast aspersion on either of them for starring in romantic comedies or blockbusters. It is a job when you get right down to it and that may have been what both of them thought about BBM. They're glad that it turned out to be more, but nevertheless they didn't want to be forever associated with it primarily. They're glad that it turned out to be more, but nevertheless they didn't want to be forever associated with it primarily. Well, we don't know that either. And, I'd assume that they'd both want to forever be associated with all the films they worked on... not to mention their best film. When you think about Jake and Heath as "special" co-stars... it actually brings Leonardo DiCaprio and Kate Winslet to mind and the special status they share together as co-stars of an important film, and longstanding friends (in the case of Kate and Leo). Their (Leo and Kate's) status as "special co-stars" was actually made very clear in the way they were treated during the Golden Globes coverage this year. Despite the fact that both Leo and Kate have had many important roles with lots of famous actors... there's an acknowledgement that they will forever be linked in a special way both in the public eye and in cinematic history. Leo and Kate are the icons associated with a love story that impacted so many people (not me actually, I never enjoyed Titanic) and I think that Heath and Jake have that kind of status, especially in the gay community. It's interesting to think about since it seems that the BBM poster was designed with the Titanic poster. To me, it seems that Jake and Heath have the potential to be that kind of duo as time goes along in terms of permanent association. This is especially the case for Heath due to his tragic passing and career that's been cut short. Even with Heath's important role in TDK, I don't think that those co-stars rise to the same level of association as Jake does for Heath. And, I think this is particularly the case where serious cinematic history is concerned. Perhaps, but Leo and Kate are both straight actors. An off-screen close friendship between a man and woman who starred in the most money-making love story of all time is something that plays well to Hollywood, the media and to the fans. It does nothing to hurt their careers and can even enhance it Both Jake and Heath are straight actors (so far as we know). Maintaining a close friendship off screen is something both men might have had, but it doesn't play very well to Hollywood because they played two gay men. This can lead to rumors, to type-casting and can be damaging to both their careers. Hollywood is not totally on board yet with the idea that outwardly gay men can be leading men. They may be proud of their work with good cause, and be friends of a sort off camera, but they might not have wanted to be associated primarily with a movie about two gay men sorry to say. Well, I certainly hope this isn't the case. And, when thinking about Jake in particular, I recall him being interviewed on a red carpet during the BBM days (it may even have been the Oscars red carpet back then) and he said he would never be ashamed or embarassed about anything having to do with the content of BBM. He seemed affronted by the questioner who asked about his comfort level in being such a promiment figure in a now-iconic gay movie. I think Jake is sensitive and genuinely understanding enough about gay issues (I'd assume, especially since he played Jack Twist... and probably has an understanding of that character beyond what many of us imagine) that he wouldn't let any element of homophobic reaction to BBM impact his decision about whether or not to offer a eulogy to Heath. If so, some kind of tremendous step backwards has taken place... in terms of bowing to homophobic attitudes. And, I really don't believe that of Jake. I think and would hope he would rise above that kind of concern. I still believe his silence probably has to do with strong personal emotions... but all of this is clearly speculative. And, these questions will continue to nag at us. I still think a lot of the Brokie community is waiting for some kind of closure or resolution about the Jake question. I don't Jake owes us, the fans, anything. I think he made his peace personally with Heath in his own way. He was very silent, and unseen, if you remember, right after it happened. To me, looking at all the photos and watching the videos and interviews done with them around the time when the movie came out, it showed that Heath & Jake were pretty good friends. I think you have to be a very special friend of someone if you are asked to be their child's godfather. Everyone grieves in their own way. I think Jake chose to keep it personal. Someday he may mention something about Heath, or BBM. It's almost inevitable, isn't it, that the topic would come up at some point in the future? I don't Jake owes us, the fans, anything. I agree that I don't think this question is about appeasing his fan base, to me it's about doing something to honor Heath. I'm sure it will come up at some point for Jake. He still seems to be deliberately trying to avoid a lot interviews and especially spontaneous interviews like red carpet comments. But, I also do think it's inevitable that questions will be put to him in some forum at some point on the subject of Heath. Della and all, don't "straightjacket" Jake or Heath, or Leo or Kate for that matter!! Their sexual orientation is their own business and certainly not something for us to judge or comment on. I think it would have been nice for Jake to have said something, if not for Heath's sake, then certainly out of respect for Matilda, his goddaughter. I really haven't been in the brokie loop much of lately but if Jake didn't say anything about Heath's passing I guess that is sort of odd. Perhaps he was very distraught about it. I know when someone close to me has died in the past...well I just didn't know what to say. Maybe it was the same for him...who knows? I don,t really care any more wether he says anything or not. I guess it,s no ones business but his. Same with his costars in Candy etc. Anyway, I'm one of those who thought it would have been great if Jake paid some sort of tribute to balance out the rag rubbish written about Heath. That's why i'm grateful for all the paid tributes from family, friends, co-stars etc. Jake decided to stay silent, he has his reasons. I don't expect him to say anything anymore, to be honest i don't even want him to talk about Heath when promoting one of his upcoming movies. I think that'd be tacky and that's why i think he'll continue to stay silent. I'm ok with it, it doesn't bother me anymore. I've never really been bothered by it. He had his reasons, and ours is not to wonder why. I've always kind of thought that Heath would be bothered and bewildered by all the statements others have made - he hated drawing any kind of attention to himself. At least, that's what his closest friends seem to say about him. I've actually always felt really bad for Jake. He obviously (to me) was quite distraught over it all. His silence speaks volumes to that effect. Had he come right out and made some kind of statement right away, I'd have figured at least he was OK. My heart ached for him that he didn't. People very close to me sometimes ask me about my Dad. I still can't talk about him (because if I start, it rips me apart inside). I think you've gotta respect that everyone deals with huge losses like this in their own way, and one way isn't better than another. You've just gotta do what you've gotta do. ^^ Exactly. There really isn't a right or wrong way to greive. Everyone does it in their own way. Some people just cannot talk about it. I don't doubt Jake was deeply affected by Heath's passing. So affected that he just can't talk about it. At least not to the public. Very interesting...I don't think he's been able to talk about it up until now. you right in the same spot that you were when it first happened. that left me feeling the same. Unprepared, is to put it mildly. through that just so we can feel better. The justification that others have given. Others have said different things. Has no bearing at all on it. That was them. This is him. death, it was just a movie. Mr. Gyllenhall is an actor who was incredibly lucky to have taken part in Brokeback Mountain: it transformed him from an up-and-coming actor into an on-demand bankable star, but that's only one of the most minor reasons that the film was so much more than 'just a movie.' One only has to read the online comments people have made over the last four years of the transformative changes people have made in their lives as a direct result of Brokeback: I've lost 60lbs and actually talk with people now, dramatically life-affecting changes which have opened up the world to me, and they were made as a direct result of the impact of Brokeback: and I'm not the only one. It's difficult to lose a loved one. Anyone who has, like me, can sympathize, for what that's worth. I took care of my parents up until they died, so although I can only know your loss to an extent, I certainly feel for you. Please accept my sympathy on the loss of your brother. I hope the people who were outraged a few years ago about Jake not giving us a public show of grief will read that article.